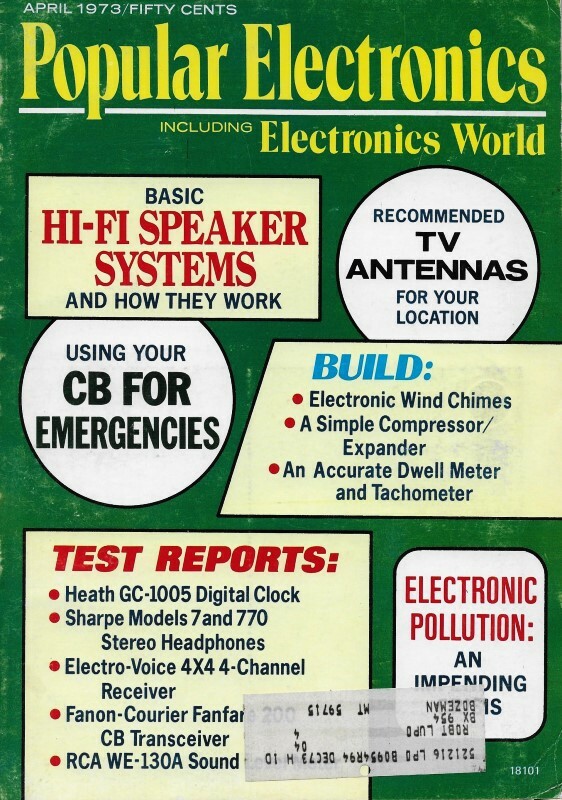 The April 1973 issue of Popular Electronics concentrated on antennas for everything from citizens band (CB) radios to televisions and amateur radio. This article covers a compact, multi-band Ham antenna with a minimal level of skill and components required. Construction tips are given. It includes the popular 10-, 15-, 20-, 40-, and 80-meter bands. Standing wave ratio (SWR) plots are shown for all four bands. Fig. 1 - Method of constructing the multi-dipole antenna. If space is at a premium, use inverted V approach. Many hams encounter problems in erecting just one antenna, so the thought of needing antennas for five bands seems out of the question. However, with about 70 feet of antenna space (somewhat less if the inverted V configuration is used) a five-band (75, 40, 20, 15, and 10 meters) antenna can be erected. The antenna has a separate dipole for each band and does not use any traps. As shown in Fig. 1, the antenna is a Single-feed, four-band, separate dipole system, using a conventional, commercially available balun transformer (1:1, 75 ohms) for a symmetrical radiated pattern on these bands. The dipoles are individually cut to any given frequency within a band using the equation L = 468/F, where L is in feet and F in MHz. 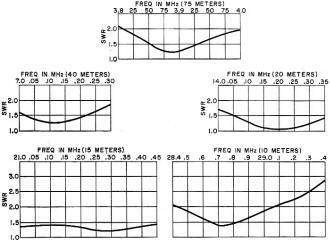 For general use, the dipoles should be resonant at the center of each band. On 40 and 20 meters, the antenna maintains a fairly consistent SWR of less than 2:1 (see Fig. 2), while on 15 meters, the curve is flatter with hardly any change in SWR from the low end to the high end of the band. On the 10-meter band, the usable bandwidth is about 500 kHz on either side of resonance before the SWR becomes excessive. Using multiple dipoles with one feedline is a common practice among hams, but the fact still remains that, for 80-meter operation, it takes between 120 and 135 feet of wire to radiate effectively. Using the popular trap-type antenna on 75-80 meters, the overall length usually exceeds 100 feet with an extremely narrow operating frequency range. The coaxial feedline does not represent a full wavelength electrically on the 40-meter band. At 7.15 MHz, the physical length of the coax is determined by (492/F) times 2 times VF, where F is in MHz and VF is 0.66 when RG-59 or RG-11U, 75-ohm coax is used. For 7.15 MHz, then the length is 90' 6". 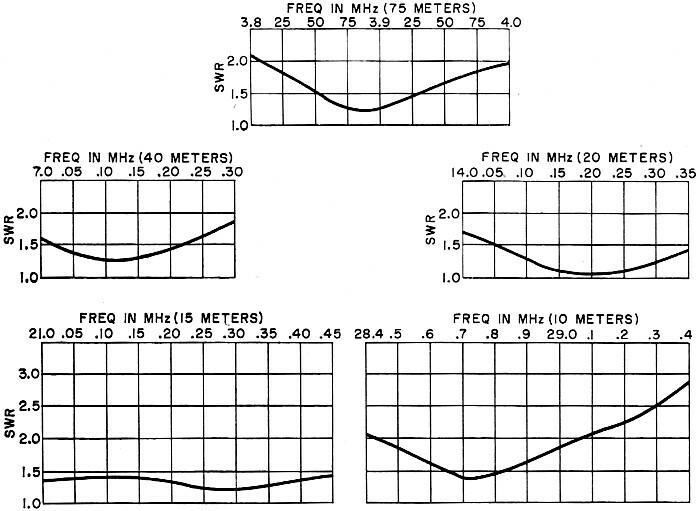 The flat top overall length at 7.15 MHz is determined from 468/F or 65' 6". This is divided by two to give 32' 9". By adding the coax length of 90' 6" to the 32' 9" of the divided flat top, a resonant length of 123' 3" is obtained, which represents a half wave of slightly below 3.85 MHz. Fig. 2 - Standing wave ratios for the antenna on various bands. On 40 and 20 meters, SWR is fairly consistent; but on 15 meters, it is relatively flat. The transmission line can be fed from the pi network of a transmitter or transceiver without the aid of an additional antenna coupler, although a coupler could tune out any reactance. The SWR is excellent for about 200 kHz of the 75-meter phone band, and does not exceed 2:1 at this point. On this band only, the inner and outer conductors of the coax are tied together at the transmitter end. In the event that operation is desired on the low end of 80 meters, a length of wire can be used to resonate at the desired frequency. The wire is then switched out when operation at the high end is desired. This additional length of wire can be simulated in an antenna coupler or by a simple L network. The radiated pattern on 75 meters is essentially omnidirectional with both vertical and horizontal polarization. Construction. The 40-meter antenna should be made of copper-clad steel wire to provide strength. Both the wire and plastic spacers used in the antenna can be obtained from a length of 450-ohm open TV transmission line, or commercially available air dielectric transmission lines. Each end of the 40-meter dipole is connected to an insulator, while the center is tied to the connectors on the balun. The remaining dipoles are suspended from the 40-meter dipole with the plastic spacers that come with the transmission line. Short lengths of plastic rod may also be used. In most cases, it is sufficient to heat the wire and push it into the plastic, where it will be firmly gripped when the wire cools. The spacers are about 6" apart along the lines. The center of each dipole is connected in parallel with the one above it, to a lug on the balun. The coax transmission line should be kept away from buildings, trees, power lines, metal surfaces, etc., when being fed as a resonant line. For the same reason, it should also be outdoors as much as possible. Keep the transmission line at right angles to the flat top dipoles if possible. The balun transformer has no appreciable loss when connected as described here and appears as a small inductance in series with the coax. Since the differential voltage across it is very small, there is no possibility of its burning out. To experiment with keeping the SWR fairly consistent from one band to another, add about 3' of 75-ohm coax to the 90' 6" length. Before trimming the coax, make sure that all dipoles are resonant at the center of each band. Then, trim off 6" of coax at a time, until the SWR becomes consistent on each band. The extra length of coax will not impair operation on 75 meters; but it will shift the frequency slightly lower than 3.850 MHz.